PRODUCT RATING Very little compromise when compared to conventional toilet paper. In our previous article about environmentally friendly toilet paper, we reviewed Green Soft, which did not perform as well as conventional toilet paper and is available only in a few locations. Since then, we’ve discovered “No Frills Toilet Tissue” that is almost as good as virgin pulp toilet paper and is available at all Wellcome outlets. No Frills is 3-ply, making it significantly more sturdy than Green Soft and is not held closed by a piece of Scotch tape. It’s soft but not too flimsy. However, it still doesn’t have the fluffy, luxurious feel of the brands of toilet paper that have clouds, cotton balls and kittens in their adverts. The color is also not bleach white, but is slightly greyish. In other words, it looks and feels a bit like the budget toilet paper that it is. In our previous article, we discussed the concern that some may have about the hygiene of toilet paper made from recycled paper. No Frills is “High Temperature Treated” and ISO 9001 Quality compliant. This, in addition to the fact that it is sold at Wellcome, hopefully should allay any hygiene concerns. In addition to being made from recycled paper, No Frills is FSC certified, an important certification for all environmentally responsible wood and paper products. The FSC label ensures that the forest products used are from responsibly harvested and verified sources. (We also recommend looking for the FSC label when buying wood furniture or office paper.) As we noted in our previous article, changing from virgin pulp to recycled paper toilet paper will save countless trees. 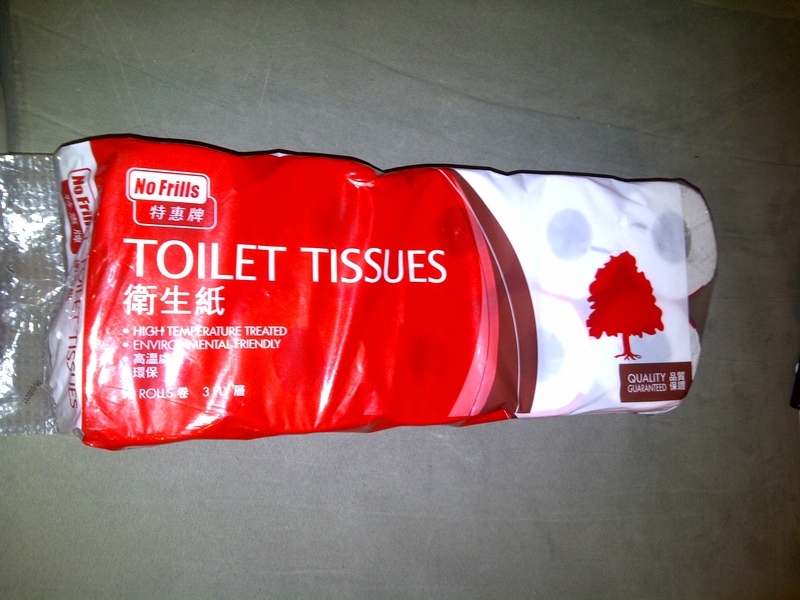 Unfortunately, the other No Frills products, such as boxed tissue and paper towels, are not made of recycled paper. Bought a pack 3 days ago and asked our maid to buy this only in the future. Thanks for the recommendation, 途人甲和路人乙, it is very helpful. Bought a pack 3 days ago and asked our maid to buy this only in the future. Thanks for the recommendation, it is very helpful.